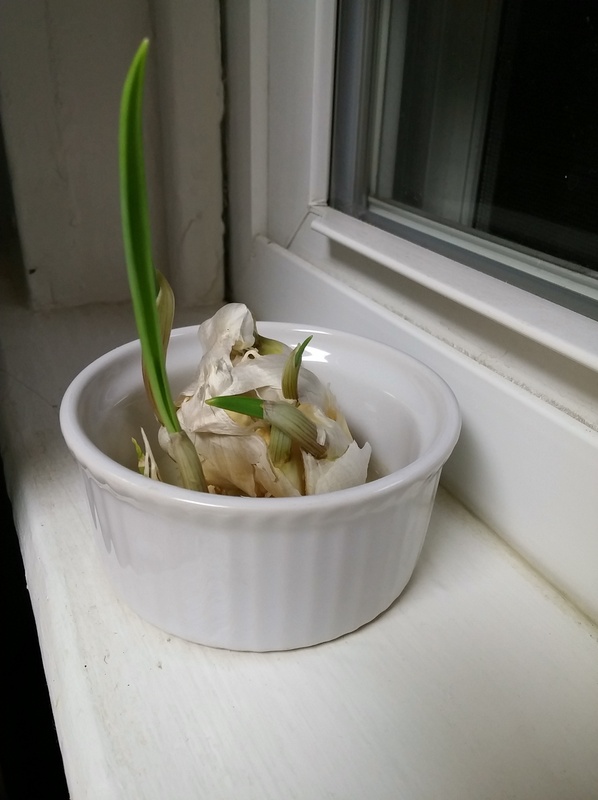 This is an update to my Adventures in Garlic. Not that there is anything wrong with eating it like this. Just snip off those seeking little green fingers and enjoy yourself some wholesome garlic. But since I am starting this journey to a more sustainable me and learning everything I can about gardening on the way, I thought it would be an invaluable opportunity to test out my apartment gardening prowess! I checked my sources and have been recommended to plant garlic in the mid-fall to early spring. (I went outside last week to dig up some soil to plant it indoors and the ground was like flaky, brown cement.) This guy, however, is going to hang out in my kitchen for a while. If I were planting in soil then I’d break apart the individual cloves, leaving the skin as intact as possible and plop each one in its own cozy plot. Now, since I can’t plant, or dig outside and my lazy bum hasn’t been round to Home Depot for some potting soil, our friend is sitting pretty in a ceramic dish on my windowsill in a little pool of water. In the spring I’ll plant it in direct sun but for now I’m keeping my garlic in a ceramic dish with just a touch of water. I’m not sure how much water it needs but I check it everyday to make sure the bottom of the dish is atleast still wet. After soaking up the first bit of water I gave it there was a yellow gell-yish goo under the garlic. I was a little concerned but that beautiful growing sprout has calmed my nerves! I’m so happy with my progress and can’t wait to plant it!!! Next > Vermiqueen Tells All! I like to lay in the sunshine and read in park. You can usually find me rolling on the floor with my daughter, cleaning a messy house, or trying to sneak a moment alone with my husband. I believe the world and everything in it was made for us to enjoy and use to the glory of God. Novice gardener, rookie homesteader, scatter-brained mother, hopeless housekeeper, and silly wife. Writing about my days and my life.